An exhibition of photographs documenting what remains of Birmingham architect John Madin’s work in the city is on display at the Custard Factory. Madin was a significant figure of post-war architecture whose Brutalist style of building design continues to divide opinion. bulldozed later this year to make way for the redevelopment of Paradise Circus. The exhibition called Madin: Some Remains is showing at the PROVIDE graphics store in Gibb Street until May 31. All images were shot in black and white 35mm film by a photographer who goes by the name ‘Dave’. The show is being supported by The Modernist magazine, which says on its website: “The work of the architect John Madin came to exemplify Birmingham’s comprehensive post war city centre redevelopment. “His story of how his work is viewed however is a depressingly common one. “He has gone from pillar of Birmingham’s establishment, seemingly given carte blanche to build whatever and where ever he wanted, to being loathed by the city’s current administration and his work becoming increasingly rare and vulnerable. 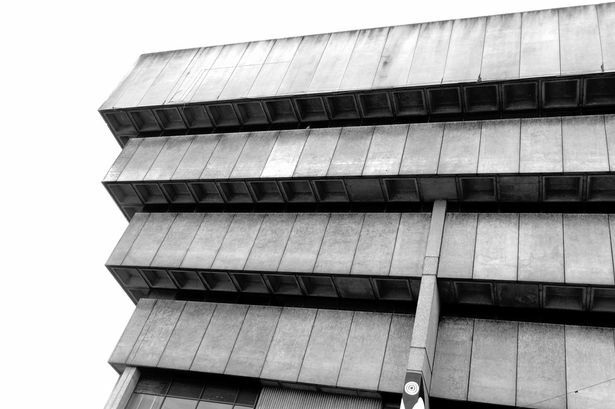 “The sword of Damocles currently hangs over his greatest work – Birmingham Central Library – its bold, brutalist form having fallen out of favour and the vagaries of fashion. In what he describes as a gesture of goodwill, Matt Nation, owner of PROVIDE, has offered a free print to any high ranking member of Birmingham City Council who can promise not to demolish any more of Madin’s buildings in Birmingham. “Madin’s work has been much neglected and is not highly regarded by the current political leadership within Birmingham, but because there is such interest in Madin’s work we wanted to involve the city council,” said Matt.